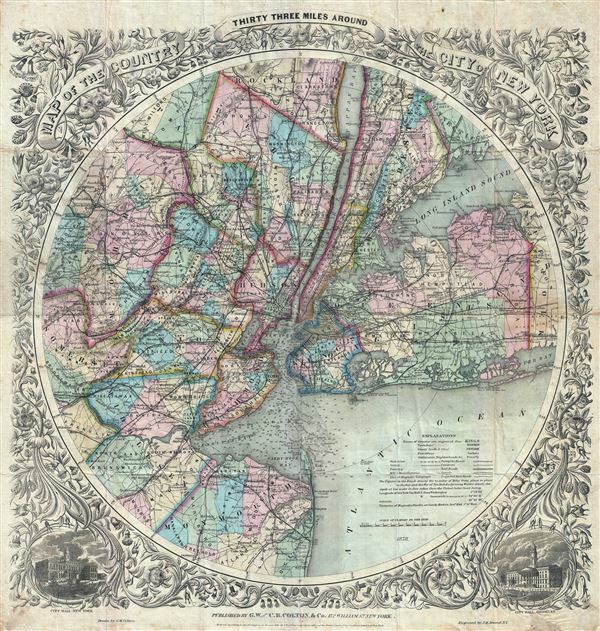 A highly decorative map of New York City. This map was drawn and engraved by J. M Atwood based upon J. H. Eddy's 1811 map of the same name. Colton's success with this attractive map was such that it was issued in various editions for over 50 years. Haskell notes eight different editions between 1846 and 1873 and Rumsey has a variant dated 1891. Dated 1878 under the explanations and scale, the copyright reads: 'Entered according to the Act of Congress in the Year of 1846 by J. H. Colton in the Clerk's Office of the District Court of the Southern District of New York.' Published by G. W. and C. B. Colton and Co. 172 William St., New York. Very good. Minor wear along some of the original fold lines. Backed with original linen. Overall age toning.